The Pacing Project was originally conceived with the primary objective of helping athletes achieve what many feel is the ultimate goal in running, qualifying for the Boston Marathon. 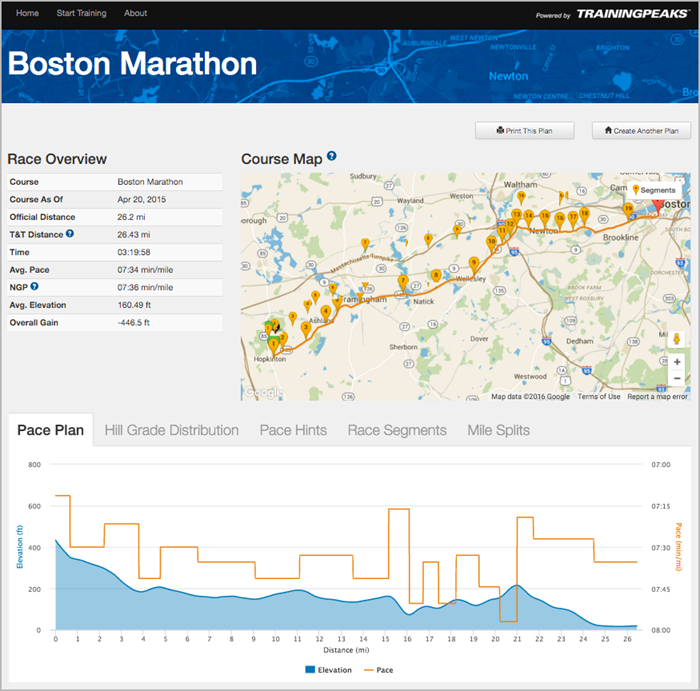 You may have even noticed the map of the Boston course at the top of the pacecalculator.com site. With just a few days until the 2016 Boston Marathon, we wanted to look back at the origins of the project, discuss why we felt a pacing tool for runners was long overdue and demonstrate the capabilities of the underlying technology. Rich Harpel and I joined TrainingPeaks when our company, Best Bike Split, was acquired in late 2014. The combined companies have been a perfect match as TrainingPeaks has always pushed the boundaries of science, along with the concept of Deliberate Practice, in endurance training, while Best Bike Split focuses on race-day planning with prescriptive and predictive modeling and analytics. As cycling and triathlon was heading into the off-season in late 2015, Rich and I discussed whether the same type of technology that drives Best Bike Split could be used to plan running races. His wife Jennifer (who will be running her 9th Boston Marathon on Monday), had been using advanced spreadsheets to plan previous qualifying efforts, but, upon inspection, even these boiled down to the same inaccuracies that face most marathon pace calculators. It was apparent that not much had changed in this domain in a long time. We enlisted the help of Laurent Therond, a TrainingPeaks senior engineer and long-time runner, who has kept at the forefront of running research to complete the initial development team. Over the next two weeks, we created the fundamental logic and technology that drives The Pacing Project. If you look at pacing tools and calculators, of which there are many, they all tend to follow similar constructs. These tools break a course into miles (or kilometers) and choose some kind of basic strategy. Strategies like running an even pace or a negative split are thrown around as an ideal way to run a race, but one thing we have proven many times with Best Bike Split is that every course is different. The strategy that worked on one course might not necessarily work on another. With The Pacing Project, we let the course dictate the optimal strategy. Additionally, in 2006, Véronique Billat had already observed that runners asked to complete a 10k run at a fixed pace exhibited a higher physiological cost, including higher average heart rate, VO2 consumption and blood lactate levels1, than when they were allowed to complete the same distance freely, at the same average speed. Hence, instead of enforcing arbitrary mile or kilometer points, the course is segmented by terrain to allow for a pacing strategy that is unique to the challenges of that specific course. The real question becomes, “Does this strategy work any better than the standard even pacing or trying to negative split?” To answer that question we have to dive into the technology and research that forms the basis of our model. Much of technology used in Best Bike Split was able to translate very nicely to The Pacing Project and run modeling. Our core prescription analytics engine and course-segmentation logic, which determines where significant gradient changes start and stop, were easily adapted. However, the missing link was the equation to tie everything together. In other words, we needed an equation that could tie a pace (or speed) to the physiologic effort required to maintain that speed. Our answer, which will no doubt adapt and evolve over time, was Normalized Graded Pace (NGP). The concept of NGP is fairly straightforward. It attempts to determine what the equivalent flatland pace would be for an athlete running up an incline or down a decline. For example, an athlete running up a 6% grade hill at a 8:00 minute per mile pace is roughly equivalent physiologically to that same athlete running at a 6:20 minute per mile pace on a flat road. There are several different graded pace formulas available, but as this forms the basis of the The Pacing Project model, we started with the TrainingPeaks NGP calculation. By comparing model pace outputs to actual runners’ performances, it became apparent that at certain negative gradients, our model would dip into infeasible territories. Laurent and I came up with the idea for a new NGP calculation that would not only address these areas, but fundamentally refine the accuracy of The Pacing Project as well as training stress metrics within TrainingPeaks. While all of this tech talk is great, can we prove that The Pacing Project is accurate or better than the tried and true pacing methodologies? This is where the power of being able to quickly model hundreds of courses and paces comes in very handy. Throughout development, we compared actual results to those the model projected. Our working theory was that elite athletes, beyond their exceptional talent, are masters of pacing. If our model is correct, it should generate pacing advice that closely match the pacing of elite runners. 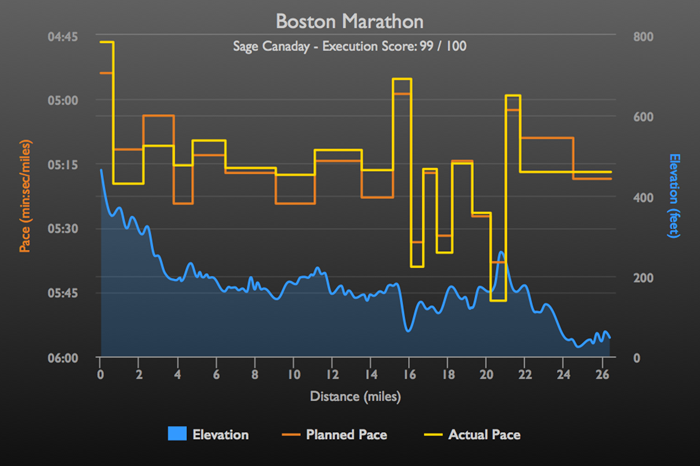 We chose three elite level runners and modeled a pacing plan using their previous Boston Marathon times. We were then able to see how the Pacing Project model compared to their actual pacing. 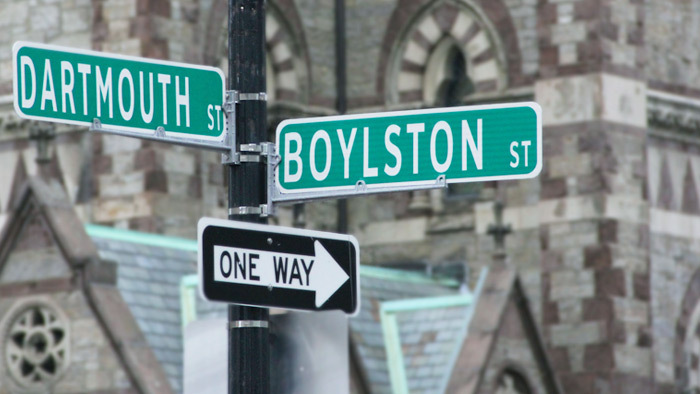 The following cases are just a few Boston-specific comparisons. 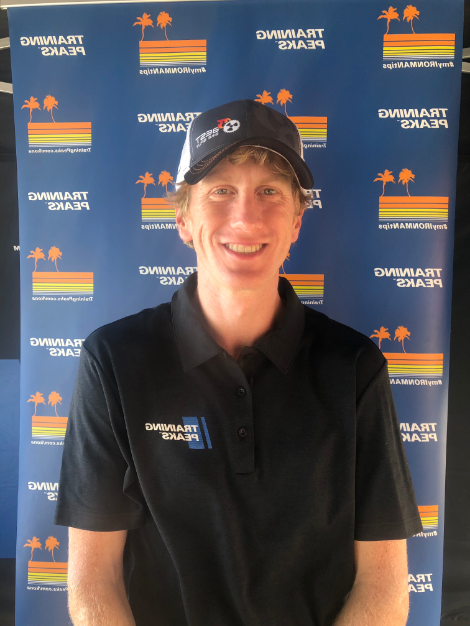 The first example is Sage Canaday, a 2-time U.S. Olympic Marathon Trials qualifier, the youngest competitor at the 2008 US Olympic Marathon Trials, and an international-level ultra-marathoner. We rated Sage 99 out of 100 for pacing in this instance. This score is a simple metric designed to quantify how much the actual race pace ended up diverging from what our model considered to be the optimal pacing necessary to achieve the corresponding race time. Sage started out a bit faster than the model then settled into a pace that matched closely, though he did push the early hills harder than the model had prescribed. Upon reaching the Newton hills, those early pushes may have cost him a bit, as his pace was a bit off, compared to the model’s estimated optimal pacing. However, overall, Sage’s pace matched the modeled pace incredibly well. The differences above are magnified due to the tight range of the pace axis. Our second example uses Mario Fraioli, Senior Editor at Competitor Magazine, a run coach, and competitive runner from the mile to the 50k, with a 2:28:25 Personal Best in the marathon. We gave Mario a 98 out of 100 execution score. 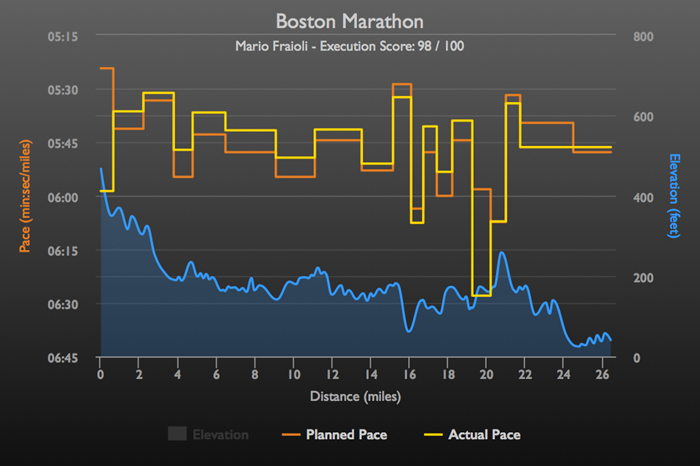 This comparison clearly shows that Mario toed the line at the 2015 Boston Marathon with a challenging, but achievable goal; and expertly executed his race. 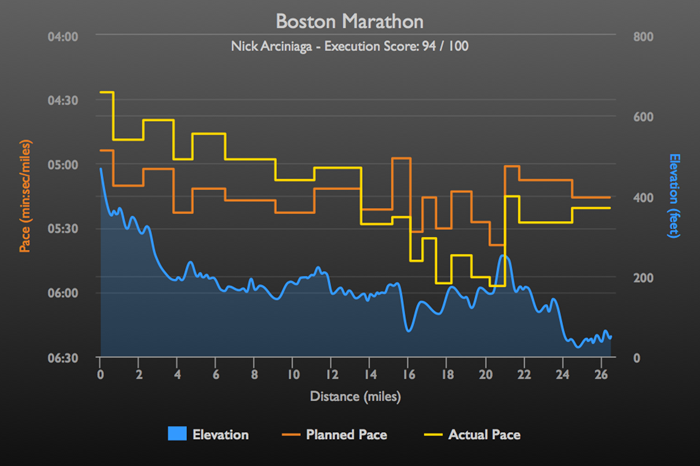 Last, we take a look at Nick Arciniaga, a 2:11:30 marathoner who finished 7th at the 2014 Boston Marathon. We rated Nick a 94 out of 100 for race execution. Nick ran an excellent race that netted him the fastest time among the examples listed here. Could Nick have achieved a faster overall time if he had started more conservatively? Such investigation will be the topic of a future post. While you marvel at the paces in these examples, let’s not forget that the most important component of a successful race is setting a challenging, but reasonable goal. A great pace plan is certainly an ace up your sleeve, but no plan will allow you to perform far and beyond your current fitness level. So, keep that in mind, as you contemplate what you might achieve during your next event. The Pacing Project is one of TrainingPeaks’ newest experiments, focused on expanding our analytical capabilities and metrics into new areas. Investing in such projects not only creates new technology, but also helps bring insight into and expand our core competencies. Future development will continue to explore and address areas that impact runners such as temperature/humidity conditions, and altitude effects. As for qualifying for Boston, you will still have to run the times, but hopefully, we can help you get there with smart pacing and a good plan. Good luck to all the runners racing on Monday.